Walking procession leaving from Ladeside fountain at approximately 1PM, heading to the village hall where the event will be officially declared open at 1.15PM, by Kinross Pipe Band. Along with village resident Tim Corcoran, Mum of three Emma Mackie is heading up a group of Mum’s in taking over the running of the Glenfarg Village Fete, after the 2018 committee stepped down and appealed for new volunteers. “Tim and I decided to take up the challenge when we realised the fete was at risk of coming to an end. We are passionate about keeping the fete alive and are hoping the local community will get behind us and support the fete. It’s a big project but one we are excited about. We urgently need volunteers to take turns manning stalls, selling wrist bands and supervising the bouncy castle, to name but a few. We rely on this help to ensure the fete’s success on the day and for years to come. We’re not asking anyone to commit to the full afternoon but if you feel you can help in any way, please get in touch. 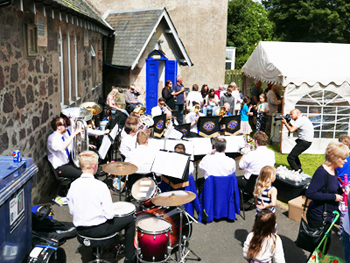 For more information on how you can help support your local fete, please contact Emma emmaloumackie@gmail.com, or message us through our Facebook page – Glenfarg Village Fete.